« Will audio ads on Pandora help it swim back across the pond? What if Apple sued Palm, would Microsoft come to the rescue? When the iPhone first launched at Macworld in 2007, I distinctly remember Apple CEO Steve Jobs boasting that the company had over 200 patents on this thing. 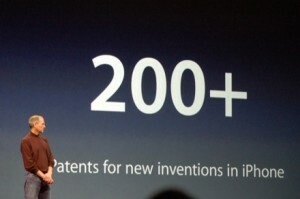 At the time, that boast stuck out like a sore thumb as I couldn’t recall Apple making such a fuss over patents before. Attempting to ‘protect’ one’s intellectual property through patent applications is something that large tech companies do every day. But the fact that Jobs felt the need to highlight this in relation to the iPhone told its own story: Apple was onto something big and it fully expected others to copy many of the iPhone’s ‘innovations’, such as the device’s multi-touch User Interface and related gestures to manipulate content. Two years on and although we’ve seen many so-called iPhone “killers” from the likes of Google, Nokia, Samsung, HTC and RIM, none of them have dared to go as far as implementing a multi-touch UI. Until just over a week ago, that is, when Palm unveiled its new Pre smartphone and accompanying webOS, which includes a capacative multi-touch display and relies heavily on gestures for navigation. None of which has gone unnoticed by Apple. I don’t want to talk about any specific company. I’m just making a general statement that we think competition is good. It makes us all better. And we are ready to suit up and go against anyone. However, we will not stand for having our IP ripped off, and we’ll use whatever weapons that we have at our disposal. I don’t know that I could be more clear than that. What if Apple did file a suit against Palm claiming patent infringement based on the Pre’s use of multi-touch and gestures, who would win and how might it change the competitive landscape? Firstly, it’s far from clear that Apple would actually win any such suit. While they have many, many patents related to elements of the iPhone’s design, if contested, I think there could be plenty of ‘prior art’ to prove that Apple’s innovations aren’t entirely original. Multi-touch User Interfaces have, I’m led to believe, existed in technology research labs for tens of years. Apple, like almost nobody else does, built on existing ideas and turned them into a successful commercial product. Just like with the original Mac and some of its Xerox PARC roots. However, intellectual property law suits are more than often not about who is right or wrong but who has the deepest pockets. This is where Apple is a Goliath compared to Palm. And in this context, Palm needs a costly and lengthy lawsuit like a hole in the head. Remember Surface, Microsoft’s multi-touch tabletop computer? It relies on gestures galore for navigation and manipulating onscreen objects, and if Redmond is to believed, has been brewing in a Microsoft R&D lab for many years. And who knows, maybe they plan to bring Surface-like features to the upcoming Windows Mobile 7 OS. That’s not to say that Microsoft invented multi-touch either but it reinforces that Palm isn’t the only cowboy in town. HP also has its own multi-touch computer. If Apple were to go up against Palm in the courts, might it be in Microsoft’s and HP’s interests to see Palm successfully dispute Apple’s patent claims. Maybe enough to back them or at least file a counter suit? I could not agree more. I think Microsoft at the very least would get involved if Apple was to try anything stupid here. Then again, we can also assume that Apple is aware of this very real possibility…and would plan accordingly before initiating any type of lawsuit. I’m very interested to see how this plays out. I don’t think Apple would file a suit without thinking through how this will send ripples throughout the whole industry. I hope it doesn’t happen too but not at the expense of stifling competitors taking the best bits and improving them. That’s what I like most about innovation: building on top of existing ideas not having to bypass or ignore them because of patents. Besides, most companies copy really badly, so just let them. The problem Apple has is that Palm looks like it has done a really, really good job. Good call Steve. I’d be surprised if Apple were able to sue Palm and win. Then again, the patent system is mostly broken anyway. *True, Palm copy really really good = Palm are desperate! Steve, your assumption is that Apple has the patents on gesture UI, maybe not entirely; maybe Microsoft or some other company has some of the patents. On the other hand, I wouldn’t be surprised if Microsoft has quietly signed an agreement with Apple or whoever has the patents on gestures UI. Microsoft has invested so heavily in their gesture table, I would be surprised if they didn’t have their patents in order.Same goes for Palm and RIM’s new storm. With this stuff it’s not just what you have but even more importantly what the other side has. Palm must have patents themselves… maybe Palm even have a patent covering all portable devices you hold in your palm. Microsoft buying Palm would be terrible news for Palm’s future and would be a complete change of strategy from Redmond. They already have the upcoming Windows Mobile 7 OS in the oven and recently bought Danger, makers of the T-Mobile Sidekick. Let’s see what that produces first. As much as I like Apple products, I get sick of patents. Patents keep other companies from competing with similar but different products. Not a huge Apple fan but… Why would I want a phone that is violating corporate patents owned by Apple? This phone's future is uncertain with all the legal trouble it could cause Palm. Which presents problems… will upgrades be available, security fixes, stability fixes? If Palm recalls this phone there will be no support for it and resell value would be nothing.